Fitness alone isn’t enough to race a fast triathlon—it’s your technique and strategy that will often have a larger role in your ultimate performance on race day. And whether you are in the early, middle, or late season of your triathlon racing, there are always details to refine. Here are five common areas where triathletes tend to lose time, and how to address each. Cold water, fish, weeds, mass starts…these are all common triggers that can bring on a panic attack or simply cause many of us to feel anxious about the swim portion of a triathlon. Of course, panicking isn’t fast. Here’s how to swim without stressing. Learn how to calm yourself down with positive statements such as “I am anxious, but I am OK” can help a lot. Realize that you are not alone. There are many athletes around you in the exact same situation. Practice open water swimming in a group to simulate race conditions prior to race day. Take your time entering the water. You can even splash your arms and face before putting your head into the water. Do a least a 5-10 minute warm-up. 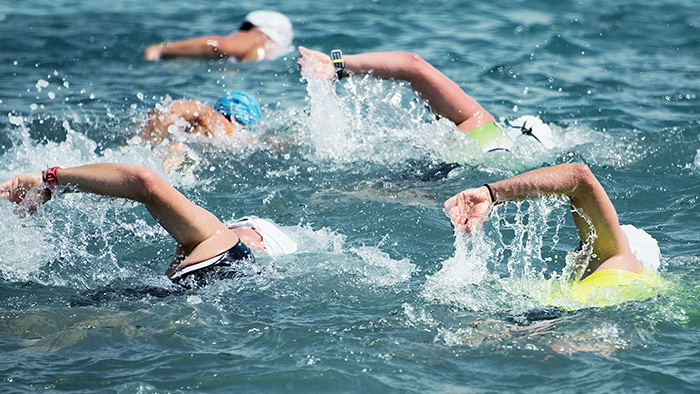 Start the race at a comfortable, moderate speed and begin to build intensity throughout the swim. Position yourself off to the side, near the back of the crowd, and find some friendly feet to follow. When training for a triathlon, you’ll spend a lot of time in the pool swimming back and forth between the lanes. But once you get into open water, you might find yourself inadvertently veering way off course, adding both time and distance to your swim. Sight more regularly to stay on course, but be aware that increasing your sighting can disrupt your stroke and body form. When practicing sighting, remember to minimize your head movement to keep your body in a better position for straight-line swimming. It’s common for athletes to naturally veer more to the left or right when swimming. It’s caused by one arm unconsciously crossing the centerline of your body. If you notice yourself veering, try wearing a snorkel mask for a few laps every training session. This lets you watch your arms as you swim, to make sure you stay centered. Gearing is one of the most important aspects of a successful race, but the chaos and overstimulation on race day may cause new riders to neglect the correct usage of their gears to get the best performance on the bike. For uphill and headwinds, it’s more effective to use the small front chain ring + bigger rear cogs. The goal is to find a smooth cadence and pedal turnover that equals a good effort to speed ratio. A typical cadence when climbing hills is 70-85 RPM. For downhills and flats, use the large front chain ring + a smaller rear cog. A good general guideline for flat roads is 85-100 RPM. This allows you to achieve less force per pedal stroke, and the ability to easily adjust to changing road conditions. The clock is always running throughout a triathlon; your transition is not a pause or break between events, but an opportunity to gain (or lose) time. Practice removing your wetsuit. Even though some bigger races have volunteer “wetsuit strippers”, having the skill to quickly remove your own wetsuit will put you ahead of the crowd. Practice putting on your shoes and socks. This might sound silly, but moving from a horizontal swim to a vertical run can disorient you, and the adrenaline of the day won’t help. It helps to prepare your equipment like you will on race day and get this movement into your muscle memory. Practice putting on and taking off your helmet. Depending on the temperature of your race, you may want to practice this with cold hands (it makes a big difference!). Practice mounting and dismounting your bike, and know how you plan to execute this in your next race—i.e. whether you will start with your shoes on your feet or, as a more advanced skill, with your shoes already clipped into your pedals. Do as much as you can on the fly. Put on you hat, glasses and number belt while running rather than standing in transition. The competitive atmosphere and excitement of racing is contagious, however almost all triathletes go out too hard on the swim, bike or run, causing them to fade fast and have a poor race. Learn to negative split. Include intervals in your workouts with the easiest pace first and then progressively get harder. Use technologies such as heart rate, GPS and power meters to create measurable pacing targets. Train your endurance. Gain the fitness necessary to avoid a big drop-off in your swim, bike or run pace.